What Have You Been Drinking? And so, in my State of the — my State of the Union — or state — my speech to the nation, whatever you want to call it, speech to the nation — I asked Americans to give 4,000 years — 4,000 hours over the next — the rest of your life — of service to America. I am assured by a native German that the brown bottle on the table is a beer bottle. 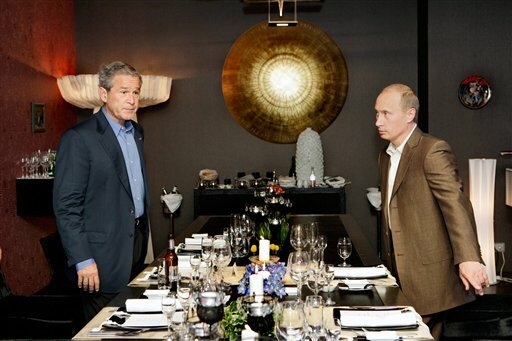 That would explain some of Bush’s boorish and childish behaviour at the G-8 summit in Germany in 2006-07. That makes sense to me, don’t it? ~ George W. Bush (1946-07-06 age:71), 2006-06-06 at the tail end of his speech about moving the National Guard to the Mexican border. Another example would be the Dred Scott case, which is where judges, years ago, said that the Constitution allowed slavery because of personal property rights. That’s a personal opinion. That’s not what the Constitution says. The Constitution of the United States says we’re all — you know, it doesn’t say that. It doesn’t speak to the equality of America. ~ George W. Bush (1946-07-06 age:71) in the second Kerry-Bush debate, 2004-10-08, promising not to appoint a supreme court judge who was intent on reintroducing slavery. Like generations before us, we have a calling from beyond the stars to stand for freedom. We’ll let our friends be the peacekeepers and the great country called America will be the pacemakers. I’ve made mistakes… I haven’t done cocaine during the past seven, no twenty-five years. In other words Bush confesses to taking cocaine either 8 or 26 years previous in either 1991 or 1973. If he meant never, he would have said so, not picked some irrelevant number. Just what are these mistakes he refers to? Obviously they include the cocaine use. 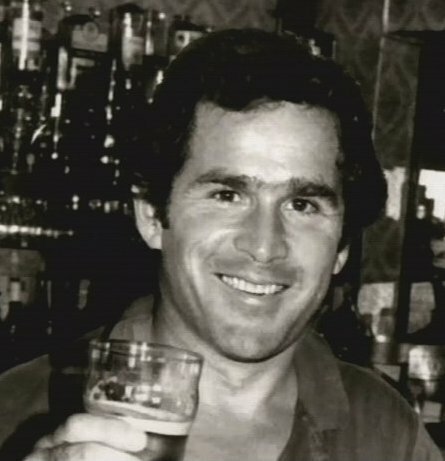 Bush is an admitted alcoholic, although he never sought treatment in a formal program. Bush had a religious conversion in 1984 at age 39, when he, as he describes it, came to the Lord after a weekend of talks with the Rev. Billy Graham. Within a year, he gave up drinking. I gather he believes all sins prior to this born again experience are automatically forgotten and forgiven. There is no such thing as a recovered alcoholic or a recovered addict. There are only recovering alcoholics and recovering addicts. Any denial of that fact keeps the addict stuck in a cycle of substance abuse. Here is a video of him drunk at Jamie Weiss’s wedding in 1992, many years after he claimed to have stopped drinking entirely. On the tape he disses people who don’t drink or smoke marijuana as boring. I don’t want any kid doing what I tried to do 30 years ago and I mean that. It doesn’t matter if it’s LSD (d-Lysergic Acid Diethylamide), cocaine, pot, any of those things because if I answer one, then there will be another one. And I just am not going to answer those questions. And it may cost me the election. 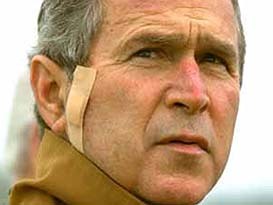 The media won’t let go of these ridiculous cocaine rumors, I heard Bush say. You know, the truth is I honestly don’t remember whether I tried it or not. We had some pretty wild parties back in the day and I just don’t remember. Bush likes to hide out in Crawford. He has taken more holidays than any other president in history. He gets into scuffles with the brush he reputedly slashes for recreation. Bush take 3 to 5 days to come out of hiding in an emergency. 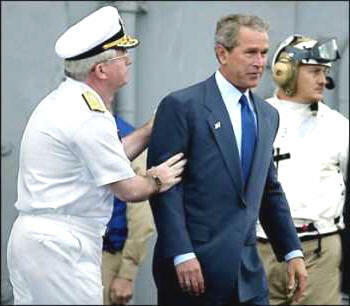 Recall how he hid completely for the first week of Katrina, unwilling to even make a short announcement. The most probably explanation is he is bingeing on alcohol and drugs, injuring himself while stumbling around stupefied and takes days to dry out enough for a public appearance. 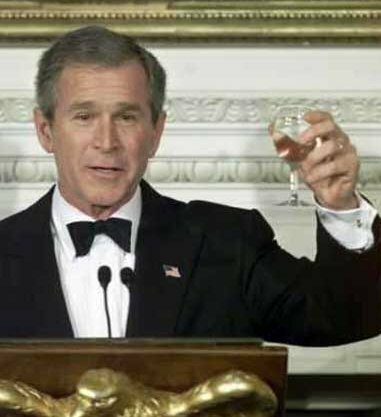 Bush was drunk at the G8 summit. One of his silly stunts was trying to give German Chancellor Angela Merkel a massage. Russia’s big and so is China. 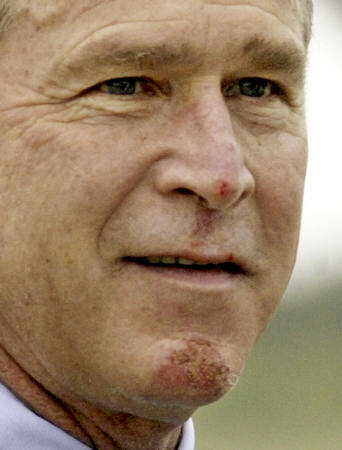 Watch Bush a decade ago and now. See how he has deteriorated. What is it? a stroke, drugs, drinking? presenile dementia?